CULTURE OF REVOLUTION · Perspective You cannot predict the future . . . YEARS AGO I HAD THE OPPORTUNITY to work on a high-profile scenario case with Peter Schwartz, renowned futurist and president of the Global Business Network (GBN). GBN was just acquired by the firm I worked for, the Monitor Group. This case was the first collaboration. 74 As a management consultant, I'd helped Fortune 500 companies to, well, make more money. As a futurist, Peter had done the same, but he had also helped Steven Spielberg design the future for Minority Report. He worked with the Department of Defense to interpret climate change as a risk to national security, and he regularly wrote for Wired magazine, including articles about hydrogen power, war, capitalism, and the future. I had a lot to learn. 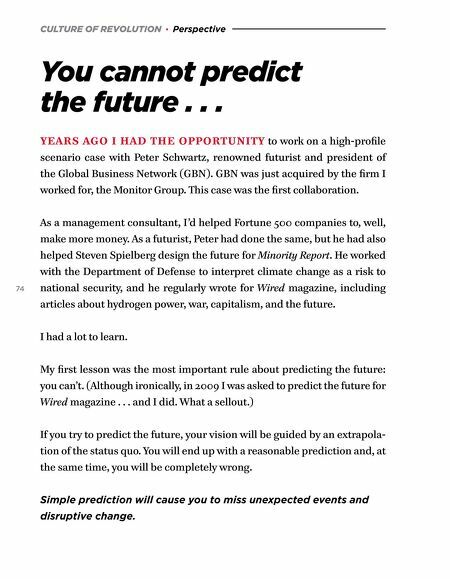 My first lesson was the most important rule about predicting the future: you can't. (Although ironically, in 2009 I was asked to predict the future for Wired magazine . . . and I did. What a sellout.) If you try to predict the future, your vision will be guided by an extrapola- tion of the status quo. 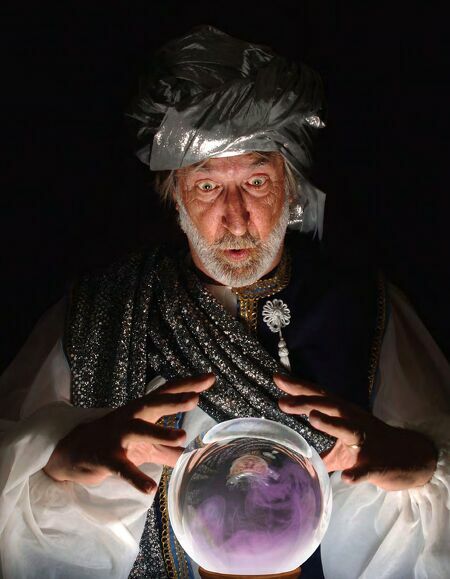 You will end up with a reasonable prediction and, at the same time, you will be completely wrong. Simple prediction will cause you to miss unexpected events and disruptive change.